1. Nas, "Life is Good": "I am a graphic classic song composer," Nas raps on the intro to his latest album. And he's right. You may disagree, but Nas is the best rapper alive, and with "Life is Good," he's got the year's top album, regardless of genre. On "Life," he's spitting rhymes about his ex-wife, Kelis - like the soulful "Bye Baby" - his daughter on "Daughters" and his childhood on "A Queens Story." He's a top-notch lyricist with a knack for storytelling, and it all makes for impeccable music. He knows life is good, and so is this album. 2. Of Monsters and Men, "My Head is an Animal": The Icelandic fivesome have melodies that are eerie, jamming, groovy and overall epic. The voices of the male and female lead singers blend so beautifully that it sounds like magic. 3. Elle Varner, "Perfectly Imperfect": Her raspy and powerful voice, over crisp production, easily gives Elle Varner R&B's best offering of 2012. The 12-track set has an amazing flow that will have you hitting the replay button again, again and again! 4. Lianne La Havas, "Is Your Love Big Enough? ": Lianne La Havas' honesty pierces on the tracks on her debut album, and it makes the collection of songs both heavy and beautiful. She's got an acoustic folk-rock-soul sound that is unique, and what's best is that heavy voice of hers: This London singer sounds like she's singing straight to your soul. Well, actually, she is. 5. 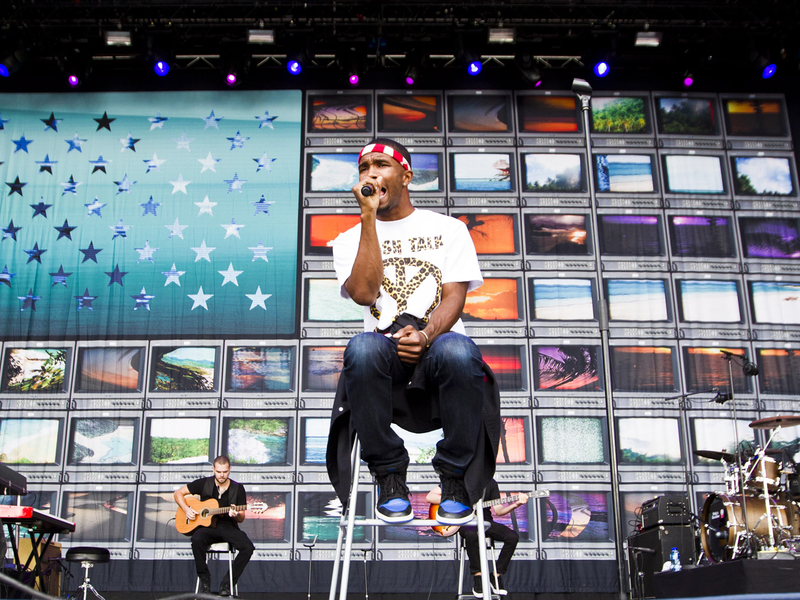 Frank Ocean, "channel ORANGE": Frank is fresh. Enough said. 6. Miguel, "Kaleidoscope Dream": It's a bit shocking - though more exciting - to see the Grammys acknowledge Miguel's multi-talents with five nominations. They got it right - he's helping change R&B without dismissing the genre's more traditional sound from acts like Faith Evans and Tamia. From "Do You..." to "Candles In the Sun," he hits all the right notes on his sophomore disc. 7. Emeli Sande, "Our Version of Events": The debut album from this Scottish import commands your attention, thanks to Emeli Sande's strong pipes jelled with R&B and pop sounds. Her voice helps her songs easily come to life - just check out "Suitcase" if you're not convinced. 8. Kendrick Lamar, "good kid m.A.A.d city": The major label debut from Dr. Dre's protege is dope for its clever rhymes and soulful skits. He's going places. 9. Mumford & Sons, "Babel": Mumford & Sons continue to hark on love and life on "Babel," and it sounds masterful with its rock harmonies that are both rugged and calming. 10. Shiny Toy Guns, "III": The year's best dance and electronic-based album isn't on Top 40 radio. Shiny Toy Guns returned in 2012 with a third album and its lead singer, Carah Faye. The foursome sounds better than ever over beats that are addictive and vibes that are dreamy. Now dance. 2. Taylor Swift, "Red": Last time, we had John Mayer to thank. This time around, Jake Gyllenhaal is most likely the reason for Swift's ire in songs like the wickedly vengeful "We Are Never Ever Getting Back Together," as well as poignant, heartbreaking songs like "I Almost Do" or "All Too Well." At 22, the former teen ingenue also flirts with sensuality on songs like "Treacherous" and "Everything Has Changed." She may still have a cutesy image, but Swift has grown up, and continues to mature into a singer-songwriter with musical gravitas. 3. Frank Ocean, "channel ORANGE": Ocean's grand statement about his sexuality seemed to overshadow the real reason why he was one of music's most important figures -- his impressive talent. "Thinkin' Bout You" gave just a taste of Ocean's allure: With the help of others, he crafted a collection of musically and lyrically daring songs that stand out starkly from the status quo of pop and R&B worlds. 1. Cloud Nothings, "Attack on Memory": Blame most of the entries on this list on a conversation I had last year with Jeff Tweedy, who said one of the ways to stay in love with music was to seek out new, young acts. Ohio's Cloud Nothings punched me in the solar plexus with this unrepentant blast of rock that tackles BIG THEMES while musically careening down a steep, car-lined street on an out-of-control skateboard. 2. Natural Child, "For The Love of The Game" and "Hard in Heaven": Mining an era that seems to have been purposely forgotten by today's young rockers, this bluesy rock trio from Nashville was on a groove so tight this year that it released two albums. It's a tossup which one's better, so we're not choosing. Both show they could be Nashville's next breakthrough band. 3. Kendrick Lamar, "good kid, m.A.A.d. city": Displaying the limitless ambition of a young RZA or Kanye West, this much-anticipated, Dr. Dre-sanctified release is a cinematic concept album stuffed full of examples of the Los Angeles rapper's versatility, creativity and willingness to take chances most other rappers would blanche at. 4. Jack White, "Blunderbuss": We've been waiting a long time to hear what White would sound like without the filter of his many, many bandmates. "Blunderbuss," a little bit whimsical, a little bit menacing, offered all the things we'd hoped we'd find, plus a few surprises. 5. Alabama Shakes, "Boys & Girls": This debut album from the Alabama rock quartet heralds the arrival of a major talent in singer Brittany Howard, but she's not the only star here. Her bandmates craft simple but compelling, soulful music that combines with Howard's voice to make some of the most uplifting rock we've heard in years. 6. Frank Ocean, "channel ORANGE": The Tweedy Effect really kicked in last year when I heard Ocean's mix tape "nostalgia/ULTRA," probably the best album of 2011. While "channel ORANGE" is disappointingly restrained musically, like "nostalgia/Ultra" it is a triumphant example as a social document that's both fearless and insightful yet still entertaining enough to reach popular audiences. 7. Turbo Fruits, "Butter": Sometimes you just want to bob your head along to mindless songs about parties and girls and fighting and motorcycles, and the third album from these rising rockers on Kings of Leon's record label helps prove EDM hasn't killed off rock 'n' roll. Far from it. 8. King Tuff, "King Tuff": Twenty-five years after its start, Sub Pop is still unearthing bands you need to hear. This time it's Vermont's King Tuff, purveyors of weirdly irresistible sugar-coated psychedelic pop songs that refuse to leave your brain. 9. Japandroids, "Celebration Rock": Beginning and ending with the sound of fireworks, this Vancouver, British Columbia, two-piece's album is exactly what its title describes - grand, anthemic songs about the great moments in life. 10. Trampled By Turtles, "Stars and Satellites": The awesomely named Minnesota string band has been on the rise for years and its gentle, introspective sixth album adds a layer of artistry and emotion only hinted at in previous work.